was born in North Carolina between 1798 and 1802. His father may have been George Hulme, a Revolutionary War veteran who was a sheriff in North Carolina and then in Tennessee where Robert may have grown up. Robert worked as a tailor. He also served in the Texas Rangers where he was recruited by the charismatic leader, Thomas Barron, another early and more well-known member of Waco 92. It was this group of Rangers that received orders in 1837 to build a fort on the Brazos near the friendly Huaco Indians. 1841 shows Robert Hulme on the list of Rangers fighting against Indians with Gage’s Nacogdoches Minutemen. In fact, Hulme may have fought alongside Barron during Texas Revolution. In 1835, Barron led a number of valiant Texans to fight under Sam Houston in a series of skirmishes as Houston retreated towards San Jacinto. It is believed that Barron returned home due to a family emergency but his men, among whom Hulme was likely numbered, arrived at San Jacinto shortly after Santa Ana’s surrender. Thereafter, Barron and Hulme fought against native Americans living throughout central Texas, a war that would not end for several decades. Without a doubt, Hulme was among the Rangers that established Fort Fisher at Waco’s future location in 1837. The Texas Ranger Hall of Fame is at that spot today. The 1850 Census shows Robert S. Hulme, aged 49 and working as a tailor, living at the Thomas Barron residence. There is a mention of Hulme in the early minutes of county meetings. With Judge John Eubank presiding in September of 1850, Robert S. Hulme “stands by to maintain law and order and lend dignity to the proceedings.” The purpose of the proceedings was to divide the county into precincts for the first time. 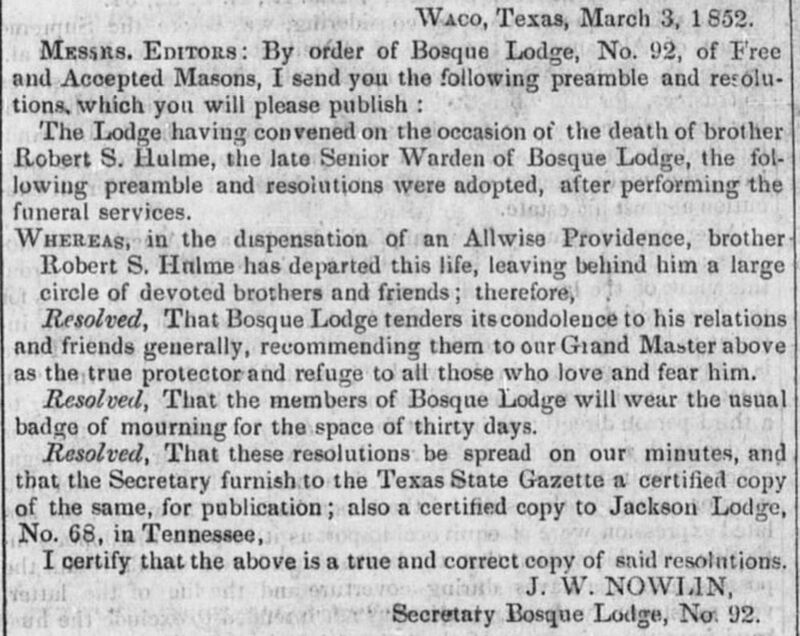 Though he never served as Worshipful Master of Waco 92, it shows a great deal of admiration on the part of our charter members that he was chosen to sit in the East during our first year of existence. His image may be lost to history but it is the opinion of your writer that there is probably a photo of him floating around in some dusty filing cabinet or some descendant’s closet in the Waco area. It would be a great success to locate such a photo and we would like to add it to the collection at the lodge.